The least expensive Mustang one could buy in 1972 was the Hardtop. It listed for $3,047 with the six-cylinder engine, f.o.b. Oakville, Ontario. The Blue Oval design team had given Mustang a major makeover for the 1971 selling season. The resulting look was hot. Sales jumped from 5,140 units delivered throughout Canada in 1970 to nearly double that figure as deals were inked for 9,604 fast Fords in the 1971 calendar year. 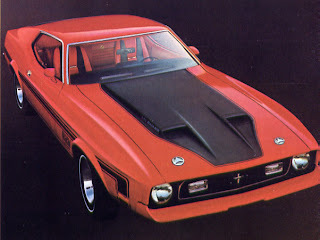 The Mach 1 was the second most expensive Mustang in Ford’s 1972 stable. 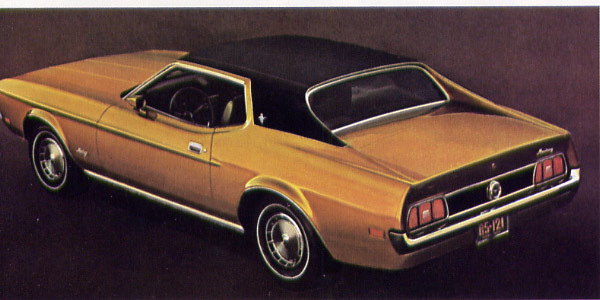 It sold for $3,452 and is shown here with the extra-cost Mach 1 décor package. The 1972 Ford Mustang Grande represented everything that was refined and elegant in motoring. It sold for $$,3415 with the optional V-8 engine. The elegant Grande was first out of the gate. Speed and power might be dirty words but luxury certainly was not. The Grande was sumptuous. Every detail delivered refined, restrained excitement to driving. Its interior was dressed in five colour choices of Lambeth cloth and vinyl. Prospective buyers were encouraged to indulge themselves and be spoiled by the luxury of the Grande. ∫ The 1972 Ford Mustang SportsRoof model carried a sticker price of $3,162. The SportsRoof model carried a tinting on the vast expanse of rear glass. “The low, sleep profile and wide stance contribute to its exceptional roadability and handling ease,” advertising bragged. The aerodynamics might help the car go a wee bit faster but it wouldn’t make up for any horsepower shorn off by government regulators. The SportsRoof package was kissed with wheel lip and rocker panel mouldings and twin colour-keyed racing mirrors. The Hardtop shared trim and many other features with the SportsRoof model. Two options for the Mach 1 and the Sportroof were a rear spoiler and a Sport Deck Rear Seat that folded down flat to give a larger storage area. 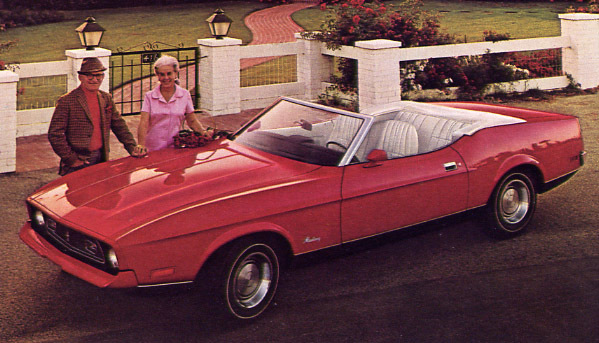 Ford's 1972 Mustang ragtop was--and still is--a head turner. The Convertible now boasted the power top as standard equipment. When that top went down it was to reveal tasteful knitted vinyl upholstery. The instrument panel was dressed up in black appliqués and the two-spoke steering wheel carried a woodtone insert. the instrument panel for the Grande Mustang boasted a tasteful wood tone applique. Without any serious speed to offer, marketing placed a great deal of emphasis on décor and trim packages as a way to generate extra bucks per unit. Ford called the extra goodies “better idea options” and Mustang Designer Kits. These promised to encourage freedom of expression. The Décor Group was available for the Hardtop and Convertible. This extra-cost exterior included a black honeycomb grille with sport lamps integrated into it, a colour-keyed front spoiler/bumper, colour-keyed hood and fender mouldings polished off nicely with wheel trim rings and hub caps. One could also order bodyside tape stripes in black or argent. The horse could be dressed in any of 16 colours. Ivy Glow and Gold Glow were among seven new hues that bowed this season. Also on the palette were White, Medium Bright Yellow, Medium Lime Metallic, Bright Red, Bright Lime, Bright Blue Metallic, Bright Red, Medium Ivy Bronze Metallic and Light Pewter. To add to the fun, there were five vinyl roof colours. There was plenty of optional equipment for Mustang. For extra money one could have a centre console, SelectShift Cruise-O-Matic Transmission or a four-speed manual transmission with a Hurst Shifter. The centre console contained an integral electric clock. There was a Convenience Group that included a headlamp reminder buzzer, glove box lock, an automatic seat back release, courtesy lights and a parking brake reminder light. There were lights for the trunk, glove box and under the hood as well as a map light. One could order the SelectAire Conditioner, power steering and the five-way adjustable Tilt Steering Wheel. AM Radio, AM/FM Stereo with or without the StereoSonic Tape System. power front disc brakes, power windows, vinyl tops, rear window defroster, a Rim-Blow three-spoke steering wheel, white sidewall tires, numerous tire and wheel cover options including Magnum 500 chrome wheels. There was a special dress-up package for Mustangs that were ordered with the 351 V-8 engine. Designed to set this ‘Stang far apart from its lesser kin, the kit included speed demon items that included Dual Functional NASA-Type Hood Scoops, dual racing mirrors, a black or argent painted hood, engine CID/Ram Air decals and twist-type hood locks. The package wasn’t just pretty, either. The competition suspension and the Wide Oval whitewall tires designed to add grit to the road. Sales of Ford Mustang beat the 1971 figure, rising to 10,292 units delivered in the 1972 calendar year. Though no one in the Oakville office could know, things would be even better for 1973.